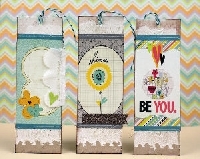 1) You will make one handmade bookmark. It can be any size/ style you like, so long as it is still useful as a bookmark. (Not huge, not too bulky, etc.) Make sure you seal it with something when you're done, so as not to let the art media transfer onto book pages. Aside from that, any art form is welcome, but stickers are for embellishment only. Printed artwork is acceptable if you want to color and/or add to it to make it unique. Have fun & happy swapping! Any questions, feel free to comment. I will angel if needed, but please message your sender first & wait 3 days for a response if you think you've been flaked on. Mail is not reliable enough to be impatient about. Please be kind. I've been asked about fabric bookmarks & sealing. Fabric bookmarks are fine with me, just make sure it's secured together well. As long as nothing will come off the bookmark, you don't need to seal it in that case. But for the love of goodness, if you have any sort of glitter on your bookmark, be it glued loose or gel pens, whatever, please seal it.